WILLISTON, FL – RHINO Gun Cases Inc. is proud to introduce a new line of high end chokes, the Thunderbolt Series. 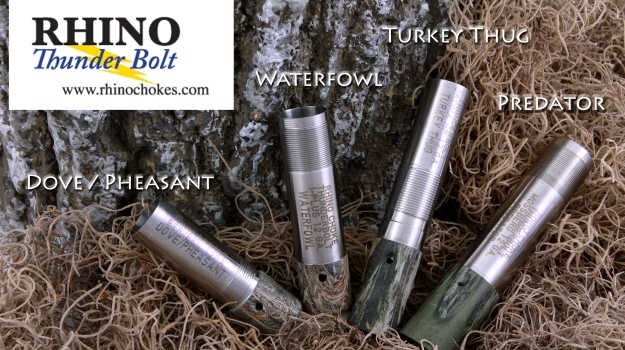 The Thunderbolt Series offers Turkey Thug, Waterfowl, Dove/Pheasant and Predator. With 35 years of patented design, manufacturing and marketing on our other lines of chokes, RHINO has developed another superior choke design worthy of joining our product line. RHINO’S Thunderbolt Series is designed around our patented port hole design. The holes are designed as wad strippers. This design allows the shot stream to develop and maintain itself with zero interruption and interference from the wad, therefore producing 33-percent more consistent and more uniform shot patterns than any other choke. The by-product of the porting reduces felt recoil by as much as 10-percent aiding in reduction of recoil in the 3” and 3-1/2” magnum shells where reduction of recoil is most necessary. One of the unique features of the ported Thunderbolt design is the capability to handle all shot loads unlike any competitor’s ported chokes. The Waterfowl and Dove/Pheasant series is offered both in early and late season restrictions. For more information, log on to www.rhinochokes.com or call 800-226-3613. Hunters educate turkeys to the fact that when they hear doors slam and owl hoots that more-than likely there’s a hunter in the woods. So, when I’m hunting public lands, I don’t use an owl hoot or a crow call. Before you even step foot in the turkey woods, you must pattern your shotgun. You have to know your choke pattern at different yards with different loads to know how your shotgun will perform in the field. If doves see movement that is natural, like a spinning wing dove decoy, they will come closer to get a better look. I have found that dove decoys can be very effective, and spinning wing dove decoys tend to be the most effective for drawing in doves. 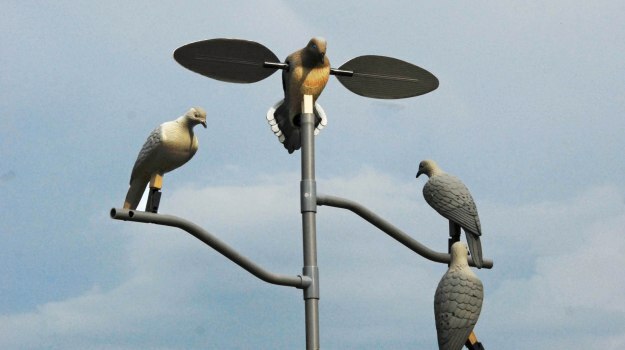 Dove decoys tend to give you a closer shot and a cleaner harvest.